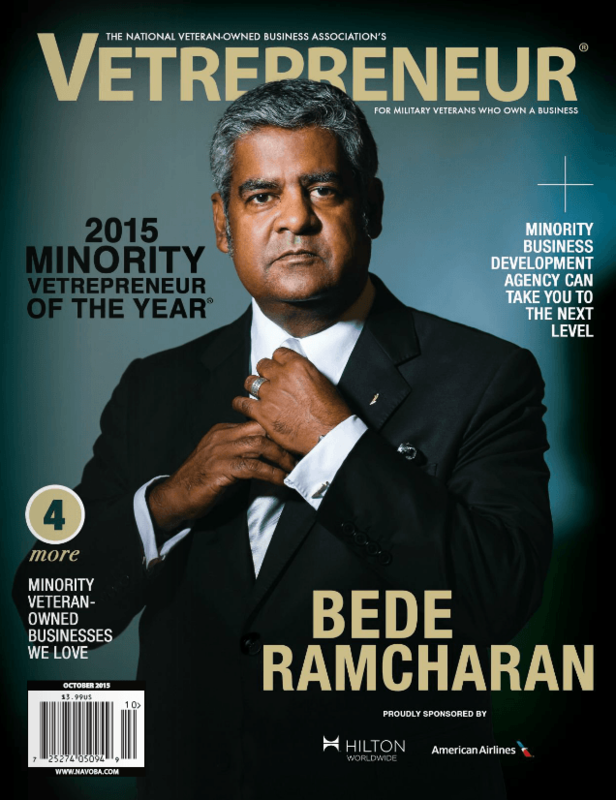 San Antonio, Texas – Bede Ramcharan, President & CEO of Indatatech, has been named the 2015 Minority Vetrepreneur of the Year by The National Veteran-Owned Business Association (NaVOBA)’s Vetrepreneur magazine. Vetrepreneur is the official magazine of NaVOBA that provides information, connections and inspiration for existing veteran-owned businesses and aspiring vetrepreneurs. Vetrepreneurs represent an important segment of the US economy and one of the most prominent groups on the American entrepreneurial landscape. Bede is the CEO of Indatatech, a global supply chain services company; Managing Partner of IDTCM, a construction management and construction safety company; and co-founder of the San Antonio Veterans Institute, a 501 C(3) nonprofit aimed at helping underserved veterans in the area. Bede is a member of many boards including the San Antonio Asian Chamber of Commerce, the Houston Asian Chamber of Commerce, the National Veterans Small Business Coalition, and the National Defense Industrial Association (NDIA). NDIA is America’s leading Defense Industry association promoting national security. Bede is also the Executive Director of the Alamo City Black Chamber of Commerce. Under his leadership, Indatatech was named the Top 2015 Fast Track Company in San Antonio with revenue under $10 Million by the San Antonio Business Journal. Indatatech earned this award due to the nearly 300 percent in revenue growth from 2012. About Indatatech – Indatatech (Instant Data Technologies) is a full service management and consulting company specializing in Procurement, Logistics and Technical Services, and Human Resources Services. Founded in 2000, Indatatech has established a global presence working in over 12 countries, and numerous locations across the United States. Indatatech is a Service-Disabled Veteran-Owned Small Business (SDVOSB), a Small Disadvantaged Business (SDB), and Minority Business Enterprise (MBE). Focused on high performance, value add services, and high customer service – Indatatech can bring you solutions for “Instant Peace of Mind”.